Posted April 12, 2017 by Bailey Heard & filed under Blog, FeaturedOnHomePage. Whew! It feels good to be done with my TEDx talk. Sometimes taking a risk and doing something we’re afraid to do builds a whole new level of confidence and strengthens our faith in God’s plans for our lives. I’ve never worked harder on a project. I gave it my all and now all there is to do is wait for the next couple months to find out if TED chooses to upload my video onto their site! In full disclosure, I was uncertain whether I would: 1.) go through with this TEDx talk and, 2.) be able to give my speech fully memorized. I know that sounds crazy since I’m a public speaker, but you must know speaking has not come naturally to me. It’s been a slow and steady process of learning as I go, making tweaks, and figuring it out along the way. For this talk, the idea I wouldn’t have my notes with me caused me to feel like I wouldn’t have a safety net. My childhood insecurities about not being able to focus and retain information well crept up on me in the process of preparing for this talk. I thought about bailing many a time, but then I remembered how many people I told about this event. I even told the local paper when they did an article about my family’s journey. I knew I had to do this. Deep down, as scared as I was, I also wanted to prove to myself that I was capable of giving a TEDx talk. I had many conversations with God throughout this process, knowing that He is in control and would be with me every step of the way. On the day of the event I felt excited, nervous, confident, and ready! When it was my turn to go I stepped onto the stage, knowing I had done my part, and I asked God to do the rest. I walked off the stage feeling grateful for the opportunity to share my story on a global platform, hoping it would encourage and inspire others to choose courage and faith in spite of fear. It’s scary to put ourselves out there and take risks, but sometimes on the other side of our challenges are gifts that make us stronger. What risk do you want to take? What fear do you want to overcome? Make a choice, then make your way! You’ve got this. Thank you so much for your encouragement and support during the process of preparing for this event. You have no idea how much your kind comments, messages, encouraging texts/voicemails, and even some of you showing up for the event meant to me. You’re the best! Love and Blessings. 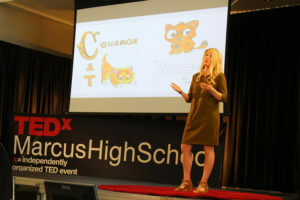 *Special thanks to Jennifer Childs for taking the #TEDxMarcusHS photos! PS – On Monday I had the opportunity to speak in Houston, TX. Special shoutout to the MOPS Copperfield ladies. You all deeply touched my heart through your vulnerability in sharing your personal challenges with me, in your support for each other, and through your kindness and warmth. I enjoyed every second of being with y’all! PPS – Headed to Yoakum, TX to speak at a hospice event on April 27th. I’m looking forward to getting to stay with my late husband, Andrew’s, parents and hopefully catch up with some of my friends from Cuero. I’ll let you know more about the details of the event as the date gets closer and if you’re in the area, I’d love to see you there! Your courage is astounding. Thank you always for sharing. Hi Shannon! Thank you so much for your encouragement! I really appreciate you taking the time to read my blog posts. Blessings Shannon. Hi Kelly! It was such a pleasure meeting you! You were so helpful and such a blessing to me. I appreciated you opening up and sharing some of your journey with me. You are an incredible woman of God and I’m continuing to pray for you. Blessings sweet Kelly.